A series of community walking tours set out to engage the public in the past and future of Mirvish Village. Mirvish Village was shaped by community involvement and engagement. A series of “walkshops” curated over the weekend by Westbank Projects Corp.—the developer that bought the 1.8-hectare property back in 2013—sought to create a space where public opinion could continue to have an effect on the redevelopment. 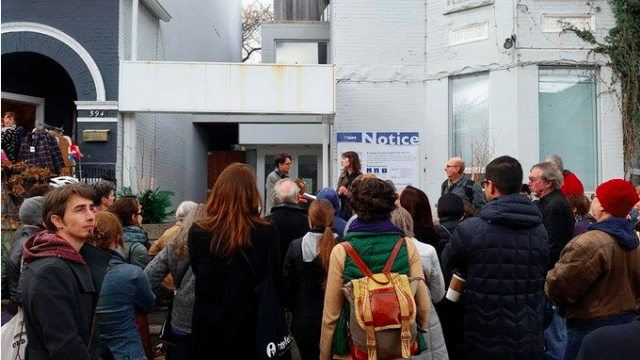 Torontonians from all over the city showed up at Westbank’s third Mirvish Village walkshop on Saturday afternoon and voiced their questions and concerns about how the redevelopment could incorporate the building’s quirky and unique sense of character. Although attendees expressed mixed emotions and views on the redevelopment, the crowd collectively agreed that they valued the familiarity of Mirvish Village, its friendly community, and the bazaar-like feel that organically developed over decades as a result of the Honest Ed’s legacy. Although Jonah Letovsky, project co-ordinator at Westbank, was present to answer questions about the area’s redevelopment, the walk focused primarily on the neighbourhood’s history. As Farrow would point out, the main purpose of the walks was to stimulate conversation. This would help the project’s developers understand what members of the community want to see in the redevelopment. As Farrow walked the crowd of approximately 40 people around Mirvish Village, Cohen talked them through the history of the community and why it looks and feels the way it does today. For example, Anne Mirvish, Ed Mirvish’s wife, was an artist and wanted the block’s rental units to be accessible to the city’s creative class. Because of that, a strong artistic community developed. Several of the properties rented out were also home to restaurants and bars. Eventually, the loud and frequent Mirvish parties led residents to make noise complaints to the City of Toronto, which in turn created a bylaw that would prevent any restaurants from opening on the west side of Markham Street. “One of the things that’s fascinating is that it’s a site of layered history. There is that threat of demolition, but demolition is part of how the Mirvishes shaped the site,” said Cohen, referring to the woman’s clothing store that was demolished to make room for the Honest Ed’s building as we know it today. With the block’s redevelopment poised to begin in 2017, that layering is set to continue. CORRECTION: November 10, 2:04 PM An earlier version of this article incorrectly identified Jane Farrow under her former position as Executive Director of Jane’s Walk. It also misnamed Westbank Projects Corp. as Westbank Properties. We regret the errors.